This year, Americans celebrate the centennial of the National Park Service. On August 25, 1916, President Woodrow Wilson signed the National Park Service Organic Act. The bill culminated decades of effort by a remarkable generation of dedicated men and women who fought to protect the nation's natural wonders for the democratic enjoyment of the people. The greatest of these passionate parks advocates was John Muir, "Father of the National Parks." Muir was a naturalist and activist who wrote over 300 articles and a dozen books. In these works, he sang the praises of parks and other special natural places and called for their protection from commercial exploitation. His words still speak to us as the National Parks system enters its second century and remind us of his spirit and his principles. Earlier this summer, my son and I backpacked for five days in Yosemite National Park. No place is more closely linked to Muir than Yosemite Valley. Overwhelmed by its beauty on his first visit in 1868, he lived in the valley for 11 years, beginning in 1869. In these years, he gained national recognition as a naturalist and nature writer. In 1880, he married, became a fruit-grower in Martinez, raised a family--and stopped writing. 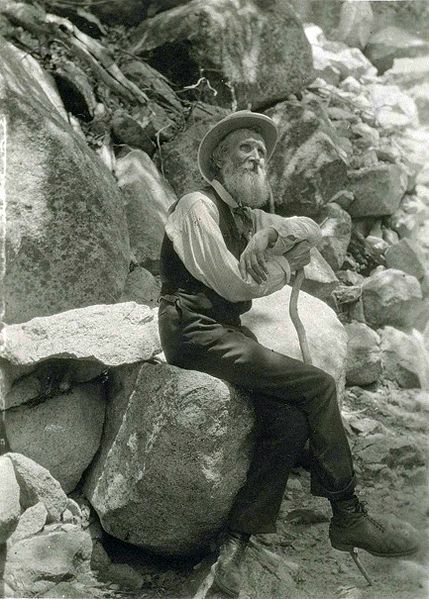 "John Muir Cane" by Francis M. Fritz. Public domain via Wikimedia Commons. 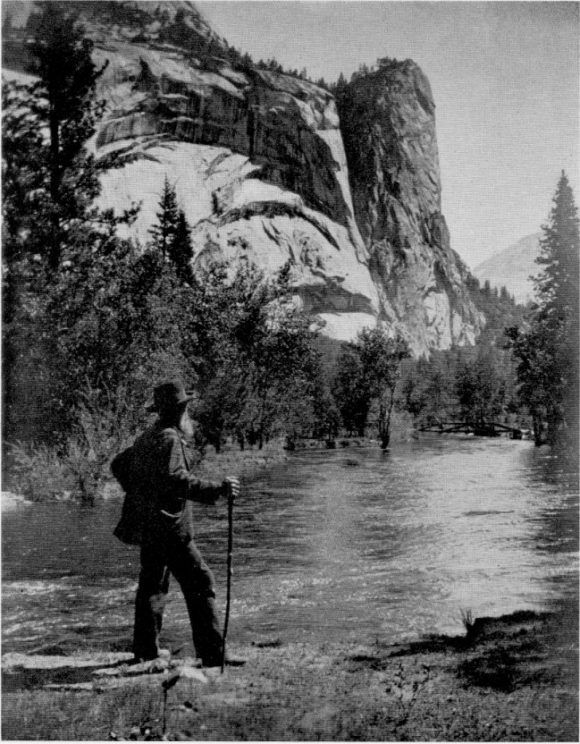 At this point in his life, Muir had done little to earn the title "Father of the National Parks." 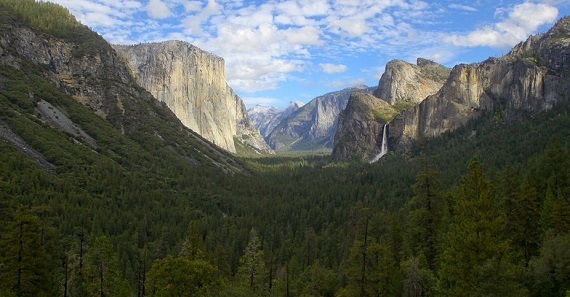 In 1864, four years before he ever saw it, Yosemite Valley was given by Congress to California as a park. Yellowstone, the world's first national park, was established in far-off Wyoming in 1872, when Muir was still relatively unknown. Muir's career took a dramatic turn in 1889, when Robert Underwood Johnson arrived in California. Johnson was the crusading editor of Century magazine and he was looking for West Coast authors. In particular, he wanted to get Muir writing again. The two men went camping in the Sierra. Disturbed by overgrazed mountain meadows and abused forests, they planned a campaign for an enlarged federal park in Yosemite. Muir wrote the articles describing the proposed park that Johnson published in Century, while Johnson pulled strings in Washington. Simultaneously, other advocates were promoting a park to protect the Sierra's ancient sequoia trees. In 1890, the two campaigns achieved the first major expansions of the parks with the creation of Sequoia National Park and Yosemite National Park. "John Muir, Washington Column" by Francois Matthes. Public domain via Yosemite Online. Johnson urged Muir to form an association to protect the new parks from destructive commercial interests. Muir co-founded the Sierra Club in 1892, which remains one of the nation's oldest and most influential environmental organizations. Johnson further encouraged Muir to write books to swell public appreciation for the parks. Muir set to work writing The Mountains of California (1894), Our National Parks (1901), and The Yosemite (1912). They did not simply extol the nation's parks. More importantly, these books called for better parks management and for protection for the nation's other natural wonders. Muir's work ignited demand for further extension of the national park system. His 1901 Our National Parks only had three parks to cover. By 1916, when the National Park Service was established, there were 14. Sadly, Muir had died two years earlier, but he had already secured his title as "Father of the National Parks." His friend and mentor Johnson remarked, "Muir's writings and enthusiasm were the chief forces that inspired the movement. All other torches were lighted from his." Now, one hundred years later, the commercialism that Muir fought so hard against is pushing harder than ever into the National Parks. Underfunded by Congress, the National Park Service courts corporate sponsors. A private concessionaire quietly trademarked iconic national park names and is demanding millions of dollars for the use of "Yosemite National Park," "Ahwahnee Hotel," and other names it had no role in creating. Anti-government ideologues and robber barons push to privatize the National Parks or devolve them to the states. Nowadays, you sometimes hear that Muir is no longer relevant in the twenty-first century. Yet, as long as we continue to respect and protect the national parks he loved, his legacy will live on. Let us also endeavor to light our torches from Muir's and keep the light bright for future generations to enjoy. Yosemite image credit: "YOSEMITE" by TVZ Design. CC BY 2.0 via Flickr.